I feel that same timeless scene arriving ….. I see the woman who gracefully shapeshifts from joyful child to wise crone to maiden and mother and back again, morphing into any age and stage she wishes with ease. She owns them all. They are all alive inside her now. In that dance through the forest of earthen mists, the white and black, the dark and light swirl in blessed honoring union. They dance together in and out forming an infinite figure eight. The light curves into the dark and the dark curves back into the light with equal reverence and ease. Blending, merging, dancing ~ all in infinite harmonized balance. What ease and freedom of Self live there. In that state of Being, we can be and choose any expression of Self in any moment. We are the timeless one, dancing without care. We know who we are there. I love who I feel there. Dance. 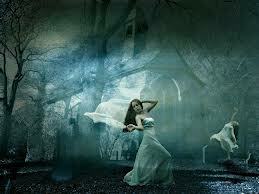 Savor the reverence of your timeless dance.